U.S. Army soldiers use a metal detector in 2002. The first industrial metal detectors were developed in the 1960s and were used extensively for mineral prospecting and other industrial applications. Uses include detecting land mines, the detection of weapons such as knives and guns (especially in airport security), geophysical prospecting, archaeology and treasure hunting. Metal detectors are also used to detect foreign bodies in food, and in the construction industry to detect steel reinforcing bars in concrete and pipes and wires buried in walls and floors. Early metal detector, 1919, used to find unexploded bombs in France after World War 1. Towards the end of the 19th century, many scientists and engineers used their growing knowledge of electrical theory in an attempt to devise a machine which would pinpoint metal. The use of such a device to find ore-bearing rocks would give a huge advantage to any miner who employed it. Early machines were crude, used a lot of battery power, and worked only to a very limited degree. In 1874, Parisian inventor Gustave Trouvé developed a hand-held device for locating and extracting metal objects such as bullets from human patients. Inspired by Trouvé, Alexander Graham Bell developed a similar device to attempt to locate a bullet lodged in the chest of American President James Garfield in 1881; the metal detector worked correctly but the attempt was unsuccessful because the metal coil spring bed Garfield was lying on confused the detector. The modern development of the metal detector began in the 1920s. Gerhard Fischer had developed a system of radio direction-finding, which was to be used for accurate navigation. The system worked extremely well, but Fischer noticed there were anomalies in areas where the terrain contained ore-bearing rocks. He reasoned that if a radio beam could be distorted by metal, then it should be possible to design a machine which would detect metal using a search coil resonating at a radio frequency. In 1925 he applied for, and was granted, the first patent for a metal detector. Although Gerhard Fischer was the first person granted a patent for a metal detector, the first to apply was Shirl Herr, a businessman from Crawfordsville, Indiana. His application for a hand-held Hidden-Metal Detector was filed in February 1924, but not patented until July 1928. Herr assisted Italian leader Benito Mussolini in recovering items remaining from the Emperor Caligula's galleys at the bottom of Lake Nemi, Italy in August 1929. Herr's invention was used by Admiral Richard Byrd's Second Antarctic Expedition in 1933, when it was used to locate objects left behind by earlier explorers. It was effective up to a depth of eight feet. However, it was one Lieutenant Józef Stanisław Kosacki, a Polish officer attached to a unit stationed in St Andrews, Fife, Scotland, during the early years of World War II, who refined the design into a practical Polish mine detector. These units were still quite heavy, as they ran on vacuum tubes, and needed separate battery packs. The design invented by Kosacki was used extensively during the Second Battle of El Alamein when 500 units were shipped to Field Marshal Montgomery to clear the minefields of the retreating Germans, and later used during the Allied invasion of Sicily, the Allied invasion of Italy and the Invasion of Normandy. As the creation and refinement of the device was a wartime military research operation, the knowledge that Kosacki created the first practical metal detector was kept secret for over 50 years. Many manufacturers of these new devices brought their own ideas to the market. White's Electronics of Oregon began in the 1950s by building a machine called the Oremaster Geiger Counter. Another leader in detector technology was Charles Garrett, who pioneered the BFO (Beat Frequency Oscillator) machine. With the invention and development of the transistor in the 1950s and 1960s, metal detector manufacturers and designers made smaller lighter machines with improved circuitry, running on small battery packs. Companies sprang up all over the United States and Britain to supply the growing demand. Modern top models are fully computerized, using integrated circuit technology to allow the user to set sensitivity, discrimination, track speed, threshold volume, notch filters, etc., and hold these parameters in memory for future use. Compared to just a decade ago, detectors are lighter, deeper-seeking, use less battery power, and discriminate better. Larger portable metal detectors are used by archaeologists and treasure hunters to locate metallic items, such as jewelry, coins, bullets, and other various artifacts buried beneath the surface. The biggest technical change in detectors was the development of the induction-balance system. This system involved two coils that were electrically balanced. When metal was introduced to their vicinity, they would become unbalanced. What allowed detectors to discriminate between metals was the fact that every metal has a different phase response when exposed to alternating current. Scientists had long known of this fact; in time detectors were developed that could selectively detect desirable metals, while ignoring undesirable ones. Even with discriminators, it was still a challenge to avoid undesirable metals, because some of them have similar phase responses e.g. tinfoil and gold, particularly in alloy form. Thus, improperly tuning out certain metals increased the risk of passing over a valuable find. Another disadvantage of discriminators was that they reduced the sensitivity of the machines. Coil designers also tried out innovative designs. The original induction balance coil system consisted of two identical coils placed on top of one another. Compass Electronics produced a new design: two coils in a D shape, mounted back-to-back to form a circle. This system was widely used in the 1970s, and both concentric and D type (or widescan as they became known) had their fans. Another development was the invention of detectors which could cancel out the effect of mineralization in the ground. This gave greater depth, but was a non-discriminate mode. It worked best at lower frequencies than those used before, and frequencies of 3 to 20 kHz were found to produce the best results. Many detectors in the 1970s had a switch which enabled the user to switch between the discriminate mode and the non-discriminate mode. Later developments switched electronically between both modes. The development of the induction balance detector would ultimately result in the motion detector, which constantly checked and balanced the background mineralization. The size of the coil can limit or optimize the size of the target detected. A very small coil can generally pickup smaller targets better than a larger coil. Conversely, a larger coil can usually detect larger objects from farther away, and sometimes sacrifices being able to detect smaller objects (even up close). There are trade-offs for what the "detectorist" is trying to find. Usually a detector user needs to decide which size coil will be used. On some high-performance detectors, sometimes the coil size is fixed (the coil cannot be changed) to optimize the circuitry for detecting smaller objects while still giving good depth on larger objects. Some higher performance metal detectors allow the user to change the coil size, to optimize what the user is searching for; a good example is very tiny gold pieces, usually requiring a smaller coil. Recent coil advancements have had a smaller coil inside a larger coil, and the circuitry is creating special timings between the two coils to optimize smaller and larger object detection simultaneously. Generally when using a metal detector the user should select the coil size based on "ground coverage" desired, "sensitivity" to smaller objects, distance that large objects can be detected, and the amount of "ground noise" that the coil will pickup or be able to "cancel". Smaller coils are sometimes used to focus the detecting search area to be smaller, thereby avoiding "trash" that may be present in a location. At the same time, developers were looking at using a different technique in metal detection called pulse induction. Unlike the beat frequency oscillator or the induction balance machines which both used a uniform alternating current at a low frequency, the pulse induction (PI) machine simply magnetized the ground with a relatively powerful, momentary current through a search coil. In the absence of metal, the field decayed at a uniform rate, and the time it took to fall to zero volts could be accurately measured. However, if metal was present when the machine fired, a small eddy current would be induced in the metal, and the time for sensed current decay would be increased. These time differences were minute, but the improvement in electronics made it possible to measure them accurately and identify the presence of metal at a reasonable distance. These new machines had one major advantage: they were mostly impervious to the effects of mineralization, and rings and other jewelry could now be located even under highly mineralized black sand. The addition of computer control and digital signal processing have further improved pulse induction sensors. The advantages for using a "PI detector" include the ability to "punch through" heavy mineral soil; in some cases the heavy mineral content may even help the PI detector function better. Where a "VLF" detector is usually greatly affected negatively, a "PI" is not. Metal detectors are widely used in archaeology with the first recorded use by military historian Don Rickey in 1958 who used one to detect the firing lines at Little Big Horn. However archaeologists oppose the use of metal detectors by "artifact seekers" or "site looters" whose activities disrupt archaeological sites. The problem with use of metal detectors in archaeological sites or hobbyist who find objects of archeological interest is that the context that the object was found in is lost and no detailed survey of its surroundings is made. Outside of known sites the significance of objects may not be apparent to a metal detector hobbyist. The sale of metal detectors is allowed in US. You can use metal detectors in public places (parks, beaches, etc.) and on private property with the permission of the owner of the site. In the United States cooperation between archeologists hunting for the location of colonial era Native American villages and hobbyists has been productive. In England and Wales metal detecting is legal provided that the landowner has granted permission and that the area is not a Scheduled Ancient Monument, a site of special scientific interest (SSSI), or covered by elements of the Countryside Stewardship Scheme. The Treasure Act 1996 governs whether or not items that have been discovered are defined as treasure. Finders of items that the Act defines as treasure must report their finds to the local coroner. If they discover items that are not defined as treasure but that are of cultural or historical interest, finders can voluntarily report them to the Portable Antiquities Scheme and the UK Detector Finds Database. The situation in Scotland is very different. Under the Scots law principle of bona vacantia, the Crown has claim over any object of any material value where the original owner cannot be traced. There is also no 300 year limit to Scottish finds. Any artifact found, whether by metal detector survey or from an archaeological excavation, must be reported to the Crown through the Treasure Trove Advisory Panel at the National Museums of Scotland. The panel then determines what will happen to the artifacts. Reporting is not voluntary, and failure to report the discovery of historic artifacts is a criminal offence in Scotland. The sale of metal detectors is allowed in France. The first use of metal detectors in France which led to archaeological discoveries occurred in 1958: people living in the city of Graincourt-lès-Havrincourt who were seeking copper from World War I bombshell with military mine detector found a Roman silver treasure. The French law on metal detecting is ambiguous because it refers only to the objective pursued by the user of a metal detector. The first law to regulate the use of metal detectors was Law No. 89-900 of 18 December 1989. This last is resumed without any change in Article L. 542-1 of the code of the heritage, which states that "no person may use the equipment for the detection of metal objects, for the purpose of research monuments and items of interest prehistory, history, art and archeology without having previously obtained an administrative authorization issued based on the applicant's qualification and the nature and method of research. " Outside the research of archaeological objects, using a metal detector does not require specific authorization, except that of the owner of the land. We often read, from some archaeologists, that the use of a metal detector is itself prohibited without official authorization. This is false. To realize this, one must look to the legislative intent in enacting the Law No. 89-900 of 18 December 1989. Asked about Law No. 89-900 of 18 December 1989 by the member of parliament mister Calloud, Jack Lang, Minister of Culture at the time, replied by letter the following: "The new law does not prohibit the use of metal detectors but only regulates the use. If the purpose of such use is the search for archaeological remains, prior authorization is required from my services. Apart from this case, the law ask to be reported to the appropriate authorities an accidental discovery of archaeological remains." The entire letter of Jack Lang was published in 1990 in a French metal detection magazine, and then, to be visible on internet, scanned with permission of the author of the magazine on a French metal detection website. Coin shooting is specifically targeting coins. Some coin shooters conduct historical research to locate sites with potential to give up historical and collectible coins. Prospecting is looking for valuable metals like gold, silver, and copper in their natural forms, such as nuggets or flakes. Metal detectors are also used to search for discarded or lost, valuable man-made objects such as jewelry, mobile phones, cameras and other devices. Some metal detectors are waterproof, to allow the user to search for submerged objects in areas of shallow water. General metal detecting is very similar to coin shooting except that the user is after any type of historical artifact. Detectorists may be dedicated to preserving historical artifacts, and often have considerable expertise. Coins, bullets, buttons, axe heads, and buckles are just a few of the items that are commonly found by relic hunters; in general the potential is far greater in Europe and Asia than in many other parts of the world. More valuable finds in Britain alone include the Staffordshire Hoard of Anglo-Saxon gold, sold for £3,285,000, the gold Celtic Newark Torc, the Ringlemere Cup, West Bagborough Hoard, Milton Keynes Hoard, Roman Crosby Garrett Helmet, Stirling Hoard, Collette Hoard and thousands of smaller finds. Beach combing is hunting for lost coins or jewelry on a beach. Beach hunting can be as simple or as complicated as one wishes to make it. Many dedicated beach hunters also familiarize themselves with tide movements and beach erosion. Metal detecting clubs across the United States, United Kingdom and Canada exist for hobbyists to learn from others, show off finds from their hunts and to learn more about the hobby. The metal detecting community and professional archaeologists have different ideas related to the recovery and preservation of historic finds and locations. Archaeologists claim that detector hobbyists take an artifact-centric approach, removing these from their context resulting in a permanent loss of historical information. Archaeological looting of places like Slack Farm in 1987 and Petersburg National Battlefield serve as evidence against allowing unsupervised metal detecting in historic locations. A series of aircraft hijackings led the United States in 1972 to adopt metal detector technology to screen airline passengers, initially using magnetometers that were originally designed for logging operations to detect spikes in trees. The Finnish company Outokumpu adapted mining metal detectors in the 1970s, still housed in a large cylindrical pipe, to make a commercial walk-through security detector. The development of these systems continued in a spin-off company and systems branded as Metor Metal Detectors evolved in the form of the rectangular gantry now standard in airports. In common with the developments in other uses of metal detectors both alternating current and pulse systems are used, and the design of the coils and the electronics has moved forward to improve the discrimination of these systems. In 1995 systems such as the Metor 200 appeared with the ability to indicate the approximate height of the metal object above the ground, enabling security personnel to more rapidly locate the source of the signal. Smaller hand held metal detectors are also used to locate a metal object on a person more precisely. Industrial metal detectors are used in the pharmaceutical, food, beverage, textile, garment, plastics, chemicals, lumber, mining, and packaging industries. Contamination of food by metal shards from broken processing machinery during the manufacturing process is a major safety issue in the food industry. Metal detectors for this purpose are widely used and integrated into the production line. Current practice at garment or apparel industry plants is to apply metal detecting after the garments are completely sewn and before garments are packed to check whether there is any metal contamination (needle, broken needle, etc.) in the garments. This needs to be done for safety reasons. The industrial metal detector was developed by Bruce Kerr and David Hiscock in 1947. The founding company Goring Kerr pioneered the use and development of the first industrial metal detector. Mars Incorporated was one of the first customers of Goring Kerr using their Metlokate metal detector to inspect Mars bars. The basic principle of operation for the common industrial metal detector is based on a 3 coil design. This design utilizes an AM (amplitude modulated) transmitting coil and two receiving coils one on either side of the transmitter. The design and physical configuration of the receiving coils are instrumental in the ability to detect very small metal contaminates of 1 mm or smaller. Today modern metal detectors continue to utilize this configuration for the detection of tramp metal. The coil configuration is such that it creates an opening whereby the product (food, plastics, pharmaceuticals, etc.) passes through the coils. This opening or aperture allows the product to enter and exit through the three coil system producing an equal but mirrored signal on the two receiving coils. The resulting signals are summed together effectively nullifying each other. Fortress Technology innovated a new feature, that allows the coil structure of their BSH Model to ignore the effects of vibration, even when inspecting conductive products. When a metal contaminant is introduced into the product an unequal disturbance is created. This then creates a very small electronic signal. After suitable amplification a mechanical device mounted to the conveyor system is signaled to remove the contaminated product from the production line. This process is completely automated and allows manufacturing to operate uninterrupted. In civil engineering, special metal detectors (cover meters) are used to locate reinforcement bars inside walls. ^ Poulter, Thomas C. Outline of the Scientific Accomplishments of the Byrd Antarctic Expedition II, 1933-1935. ^ Modelski, Tadeusz (1986). The Polish Contribution to The Ultimate Allied Victory in The Second World War. Worthing, England. p. 221. ^ Croll, Mike; Cooper, Leo (1998). The History of Landmines. Pen & Sword Books, Ltd. ISBN 978-0-85052-628-8. ^ "How Metal Detectors Work". 23 May 2001. ^ Connor, Melissa; Scott, Douglas D. (1 January 1998). "Metal Detector Use in Archaeology: An Introduction". Historical Archaeology. 32 (4): 76–85. doi:10.2307/25616646 (inactive 2018-09-11). JSTOR 25616646. ^ a b Tyler J. Kelley (January 16, 2017). "Archaeologists and Metal Detectorists Find Common Ground" (The New York Times). Retrieved January 21, 2017. The difference between archaeology and looting, explained Brian Jones, Connecticut’s state archaeologist, is the recording of context. ^ "Plat aux poissons du Trésor de Graincourt - Musée du Louvre - Paris". ^ "Detecteur-de-metaux.com - Or natif et trésor - Conseils et guide d'achat". ^ "Coin Shooting Tips :: metaldetectingworld.com". ^ Dave McCracken. "The Fundamentals of Electronic Prospecting :: goldgold.com". ^ Scott Clark. "Finding Jewelry with Metal Detector - lost ring :: detecting.us". ^ "Directory listing of Metal Detector Clubs in the United States and Canada :: MetalDetector.com". ^ "Civil War relic thief engaged in 'heartbreaking' destruction". NBC News. ^ Editor, Mike Pehanich, Plant Operations. "Detecting Foreign Matter". ^ "History - Fortress Technology". Grosvenor, Edwin S. and Wesson, Morgan. Alexander Graham Bell: The Life and Times of the Man Who Invented the Telephone. New York: Harry N. Abrahms, Inc., 1997. ISBN 0-8109-4005-1. 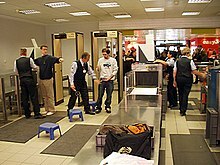 Wikimedia Commons has media related to Metal detectors.